My wok, which I love to bits, gets plenty of action. It gets connected to my induction hob at least twice a week, and a stir-fry of sorts is definitely on the cards. Having just returned home from a grocery shop after work, I started to unpack what I had bought and and found at the back of the fridge a few ingredients in dire need of eating today – or else – what I try to avoid at all costs – food waste! So, with a left over helping of cooked jasmine rice, some asparagus spears and a steak knocking around, what was I going to cobble together? I recently purchased a copy of Ken Hom’s Kitchen Table: 100 Easy Chinese Suppers from Amazon (where else) and was torn between three different recipes. 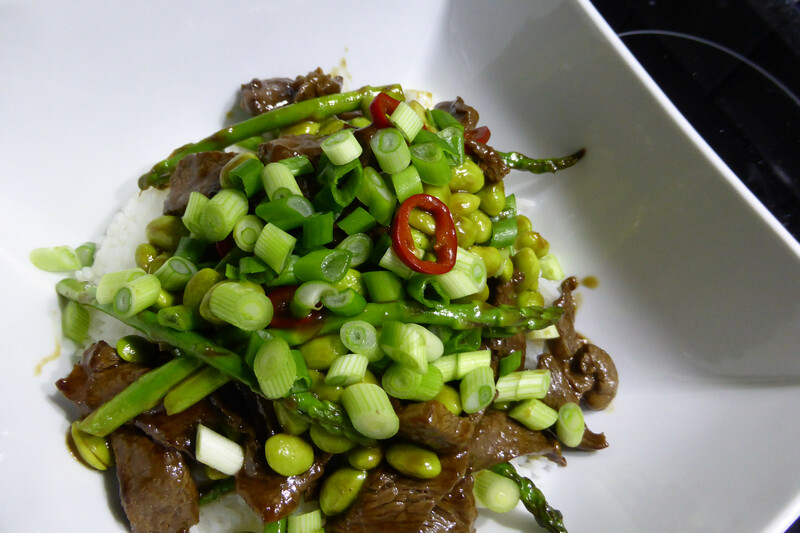 As I was indecisive, I decided to cherry pick the parts I has the ingredients for and ended up with stir-fried beef in oyster sauce with asparagus & edemame beans. 1 x 200 – 250g rump steak (or other cut if feeling like it), sliced into thin strips. 2 x spring onions, trimmed and finely sliced. Combine the sesame oil, soy sauce, rice wine and corn flour into a small bowl, and mix thoroughly. Add the strips of thinly sliced beef, mix thoroughly and allow to marinate for 20-30 mins. Trim off the tough end of the asparagus, and if stems are long, cut in half at an angle. In a shallow dish, cover with boiling water and blanch for no more than 2 mins. Remove, and plunge in cold water (iced if possible). Once cooled, drain in a colander and set aside. If the edemame beans are frozen, defrost first. The easiest way is to cover in cold water, mix, then drain and repeat 2-3 times until the beans soften. Once defrosted, set aside and put with the asparagus. Heat up the wok to a medium-high heat. I use an induction hob, and find 7/10 works. Add the groundnut oil, swirl it around and as it starts to gently smoke (I do not want to hear of stories where the smoke alarm gets set off! ), add the beef strips and red chilli. Stir-fry for 2-3 mins until the beef starts to brown. Remove beef and chilli from wok, turn heat down slightly, and wipe away excess oil from using kitchen paper. Add the oyster sauce, and once it starts to bubble add the asparagus, edemame beans, and the return the beef and chilli. Stir-fry the ingredients for 2-3 mins until piping hot. Finally, serve with rice, and sprinkle the spring onions over the top before eating. Previous Post: « Redcurrant jelly, Dijon mustard, and herb gravy for Beef. I love stir fry and this is absolutely delicious!